How do you store your Cook Chill Bags? Depending on your operation, Stack/Nest Crates from Plascon may be just the product to enhance your Cook Chill process. 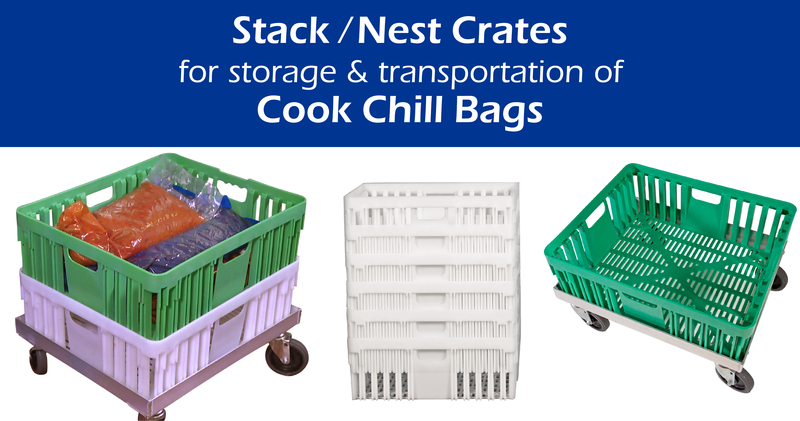 These durable crates are designed to hold multiple bags throughout the Cook Chill process, from chilling & storage to transport & delivery of the product. Available dollies with casters, allow for several crates to be stacked on top of each other and easily moved around. The crates have a “Nest” feature that maximizes storage space when the crates are not in use. If your operation is a single location restaurant, commissary, food processing facility, correctional institution, school, college/university or hospital, Stack / Nest Crates from Plascon may be an ideal solution to your Cook Chill storage & transportation needs. Plascon is your source for all things Cook Chill related. We manufacture our 7-layer co-extruded cook chill film and convert to finished cook chill bags in both clear and colored film. Our films are made with oxygen and moisture barriers to provide better flavor protection. We keep several common sizes in stock and ready to ship, and also offer multiple alternate sizes, including special orders. Our cook chill bags are available as Heat Seal, Angle Heat Seal, Handle Bags, and Clipped Bags. Looking for cooking kettles, tumble chillers, and other industrial cooking system equipment? Together with our partner DC Norris North America, a leader in industrial cooking systems, we can build the perfect cook chill setup for both small and large kitchen operations. Contact us to discuss your cook chill needs and applications. Our experience team is here to guide you through the process and help determine what will best suit your needs.